Draw a line around the box about 2 inches from the bottom. Have a grown up cut the box in two pieces. Its easiest to cut if you lay the box flat and put it back together later. Tape up the small end of the box so it is box shaped again. Cover the open end of that box with wax paper and tape it on the outside. Tape the large part of the box back together. Cut the shape of your head in the top of the box. Put the two parts of the box back together and tape them together. 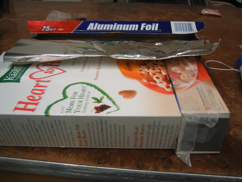 Cover the whole thing with foil to make sure that no light can enter. 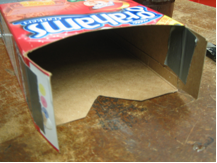 Once you are sure no light can get in, use the nail or thumbtack to make a hole in the middle of the bottom of the box. Hold your hand below the box and slowly move it upward. If you look in the hole, you’ll see the shadow move down! Go out side on a sunny day and you’ll be able to see an image upside down on your screen. Close the eye that’s not looking in the box. You want it to be as dark as possible, so you may want to cup your hand around your “looking eye”. The pinhole acts like a lens and diffracts light as it passes through. 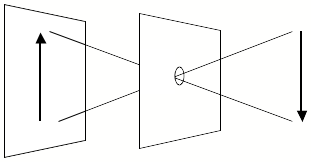 We can see the image because light reflects off of everything. Only a small amount of reflected light traveling in a particular direction can go through the hole and that’s what we see on the screen. This was originally called a camera obscura.